The LS-80 LED System uses a T20F chase/foot control system. Users can operate this easy-to-use chase controller directly from the T20F controller or with the foot switch. The T20F features 20 built-in programs: 10 normal chase programs and 10 chase programs with fade time, 7 pre-set scenes, black out, plus master/slave and DMX operation. The par cans have a polished finish and provide a 25-degree beam angle and are supplied complete with a t-bar and tripod stand that can extend up to a height of 3 metres. 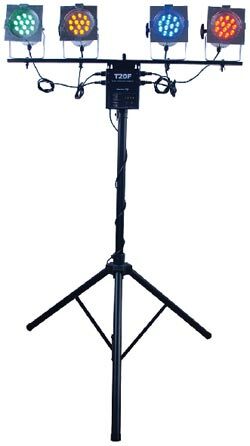 Great for any performer on the go, the LS-80 LED System is easy to set-up and take down.